Family members play an important role in determining the success or failure of children with hearing problems who use cochlear implants. Family needs to be involved in the learning process and their interactions. 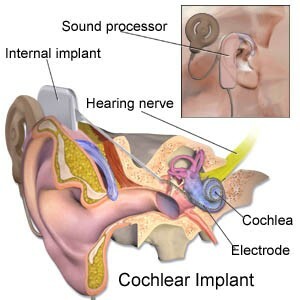 Before the implantation process, cochlear implant team should ensure that family members are able to help children in the process of repairing their hearing, where families need to understand all aspects of cochlear implants and their willingness to participate actively in the process of hearing habilitation and language-speech. The first thing that needs to understood carefully by a family members are concerned with hearing problems experienced by their child. They need to know their child’s hearing level and how far the cochlear implants can help in overcome that hearing problem. Hearing received by their child is not the same as hearing development process in other children and and the child should be monitored and trained by themselves with the guidance of Audiologist and Speech-Language Therapists. A cochlear implant device handling skills need to be mastered to ensure their child get a good amplification. These skills can be acquired during a session with Audiologist. They also assessed in handling HA(Hearing Aids) because this shows that they are always make sure their child wear HA consistently. Habilitation process plays an important role in determining the success of cochlear implantation. It requires high commitment from the patient and especially to the family because it takes a long processes time. Parents and patients need to attend Speech-Language therapy sessions frequently and prepare all the “home base program” given by the Speech-Language Therapists to ensure that children are able to achieve the targeted objectives. Speech-language therapy should be continued until the children can achieve a maximum level of communication skills for them. They are also need to attend cochlear implant mapping session with the Audiologist periodically to ensure their child’s hearing level can be increased optimally. Communication skills is not something magical and will be available achieve shortly after the implant was performed. This children also need the emotional support to interact with the other people around them. This self confidence must be learn at home by helping children to communicate freely and involved in the family. They should be treated like other children and given the opportunity and time to express what they want to say. Other than that, family members also need to give motivation to these children to continue learn to listen and speak and also communicate with other people around them. They should be given support to be successful and at the same time they are also not been ignored when they deal with failure. Indeed, this process is not a short process, but it is a long processed for these children until they are adults. Each parent needs to know their child’s potential. This is to prevent parents from forcing a child to do things that can not be done by them. Parents and families need to identify the advantages of children with hearing problems because it can be used during therapy sessions. For example, if the child is good at drawing, use his talent while doing therapy at home. Talk to them about the painting. Professionals must have told parents and family members about their expectations either too high or conducive to the child. This is also often a dispute between parents and professionals. Professional’s opinions should be respected because every family has different expectations to achieve. Expectations need to be placed for one goal would be pursued. If the wrong goals are placed, both sides of the family and the child will be disappointed because what they dream about are not achievable. Ali not his real name, was the youngest of eight siblings. Since baby, his mother suspects her son could not hear. This is because Ali did not turn or react towards sound. If he was sleeping, loud noise did not disturb his sleep. His parents get further examination at the hospital and Ali had a hearing assessment at Specialist Clinic of Otorhinolaryngology. Their hearts broke because what they are afraid of really happened. Ali was diagnosed with profound sensory neural hearing loss. When he was 11 months, Ali was wearing Hearing Aids (HA) at the both ears. Audiologist officer advised them to ensure that Ali wearing HA during awake time. The advice is followed. But it is not an easy thing for a baby to survive wearing HA with ear stuffed with ear mold. Ali often deprive HA in his ear and chew ear molds like chewing gum. His mother almost give up because had to replace the ear mold (cost: RM80 per pair) almost every month. Blessing patience of a mother who never tired of trying, finally at the age of 1 year and 6 months, Ali was able to consistently wearing HA. At the same time, his mother often do therapy at home as taught by Speech Therapist. Since then, Ali also can turned when his name was called. Her little mouth has started nag like a 6 months baby. At the age of 3 years old, Ali was able to talk with one or two words per utturances such as “want water”. But he can not hear high frequency sounds such as, / s, sy, h, f /. HA are not able to help him hear those sounds. Ali was recommended for Cochlear Implant surgery which costing RM 80 thousand. Again, his parents sad. They are not from rich families who easily can collect lots of money. For the future of their son, both parents ask for sympathy from various parties. Finally at the age of 4 years, Ali underwent cochlear implant surgery in his right ear. Hospital has become like a second home for them because they need to visit it weekly since Ali was baby. Mapping sessions and Auditory Verbal therapy sessions always attended. Laziness often discarded in the dictionary of his family life. They often take turns doing therapy at home according to the guidance provided. Now, Ali is 10 years old and he has going to school at the Ordinary School. His speech was also smooth and with no articulation error. In addition, Ali also not afraid to stand up in public to perform. Atirah, not her real name, has been diagnosed suffering from hearing problems when she was 2 years old. She was wearing HA shortly after diagnosis. During the trial, Atirah not show any reaction to the sound even drums sound. 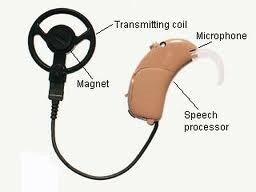 She was recommended to undergo cochlear implant because HA does not help her to hear. And she needs to do surgery immediately because she had experienced meningitis when she was baby. Her cochlear can ossified and this will cause a cochlear implant can not be executed. At the age of almost 4 years, cochlear implants carried out using the funds of Cochlear Implant from Ministry of Health. Thankfully, everything went smoothly. But unfortunately, she began to show negative behavior. She often uses the CI as a threat to the family if does not get what she wanted. CI is often thrown, and her mother was using the excuse to not put CI while at home because fear of damage. During Auditory Verbal therapy sessions, Atirah can wear the Cl well and respond to the sound. Her mother and her sister were guided on behavior management. Almost a year, then Atirah can wear CI well but in the short term. After a year, Atirah’s listening and speech skills still poor. This is because her family was given less commitment. They didn’t finish the Home Base Program given. Therapy sessions are often not well attended. Advice given by the Professionals was seemed ignored. At the age of almost 6 years, Atirah defaulted therapy and mapping sessions and need to go to Special School and choose sign language as her communication method.